ARE YOU LOOKING FOR BUSINESS IMPROVEMENT? KMA ACCOUNTANCY CAN HELP YOU FOCUS FOR SUCCESS AND GO FOR GOLD! Did you start out in business some time ago now, and when you first started you had a burning desire to achieve certain goals, you jumped out of bed in the morning as you couldn’t wait to get to it. You’ve been successful, and achieved some of what you set out to, but you’ve had a few wrong turnings or detours on the journey so far and now you have stopped to take stock and feel it’s time to motor on and get to your ultimate destination as quickly as possible. It can be a lonely road to business improvement so why not let us at KMA be your training partner and with you every step of the way helping, supporting and cheering you on. Grown your business by circumstances rather than design and now have a clear understanding of the direction you want your business to go in but you are not quite sure how to make that happen. Come and talk to Kim and the team at KMA Accountancy, they have encountered this issue many times and often you need a fresh pair of highly experienced eyes to get you back on the straight and narrow to improving your business fortunes. 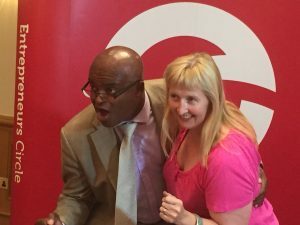 Kim and Kriss Akabusi sprinting to profit improvement! You may need to improve business just to bring in some extra revenues as you aren’t quite reaching the profit , cashflow and turnover targets you set yourself and are finding that as your business grows the costs are spiralling but your profits aren’t and you really want to improve the business. Kim and the team have helped their clients take a fresh approach and through our expertise and your enuthisam and our combined knowledge we will improve the business and it’s profits. 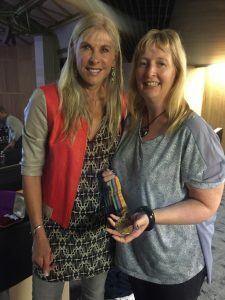 You may feel that you need to improve business because you are spending so much time working in the business that you have no time to step back, reflect on your successes to date or devise an action plan for the future. This is where we can really help you. We will use our expertise to overview the business and come up with ways, methods and time saving strategies to be implemented to allow you more time off with the family or simply more time to “work on” rather tha “work in” the business so you can make the changes necessary to improve business. Maybe you feel your existing advisers just aren’t able to offer the support you need to grow and improve business. We help clients just like you every day of the week, by suggesting and implementing proven strategies to grow and improve business by looking at the systems, processes, your pricing, your sales and marketing strategies and suggesting ways to improve and grow your business. If you already have a great compliance accountant who may be a friend or you have a long standing engagement and you don’t want to leave him Don’t we can work along side them and just help you on a monthly or quarterly basis and effectively be an extra internal team member to help you sprint forward to your desired profitability. Here at KMA Accountancy we can help you focus on your business and see it with new re-juvinated eyes so we can address whatever the issues are together as one team. We are the North West leading Chartered Management Accountants with expertise second to none in improving business and changing the lives of business owners. In fact our mission is to help North West business owners changes there lives for the better and enable them to go home early and enjoy life with their families safe in the knowledge that they have the very best successful business. We’ll help you to re-energise and look with fresh eyes and an objective approach at your customers, your pricing, your team, your sales and marketing strategy, your bsuiness objectives and your plans for improvong your business and suggest new, innovative ones aimed at making sure that you win the race when it comes to improving business. Let’s get you race ready and into those starting blocks for the off, give us a call on 0161 410 0022 to grab a coffee and set off on that race for the finish line- I guarantee it won’t be a waste of time!